The chance to run a workshop in Manila in November 2015 was a welcome opportunity for a few days mammal watching. 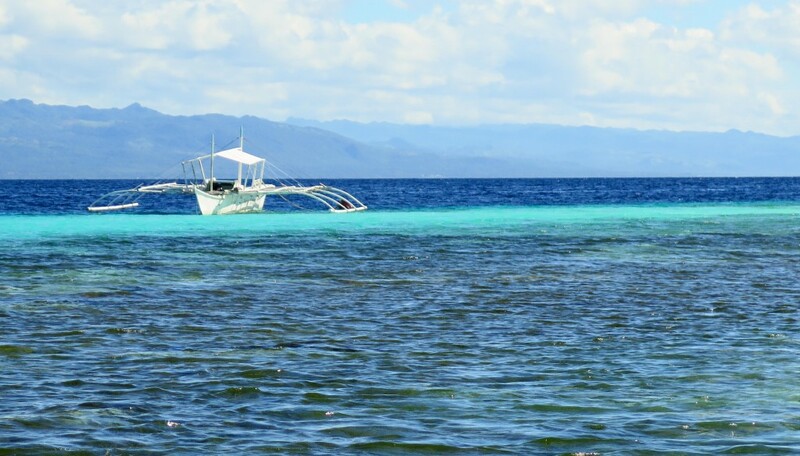 That said, the Philippines comprises more than 7,000 islands so planning what to do with my two weekends was far from straightforward. 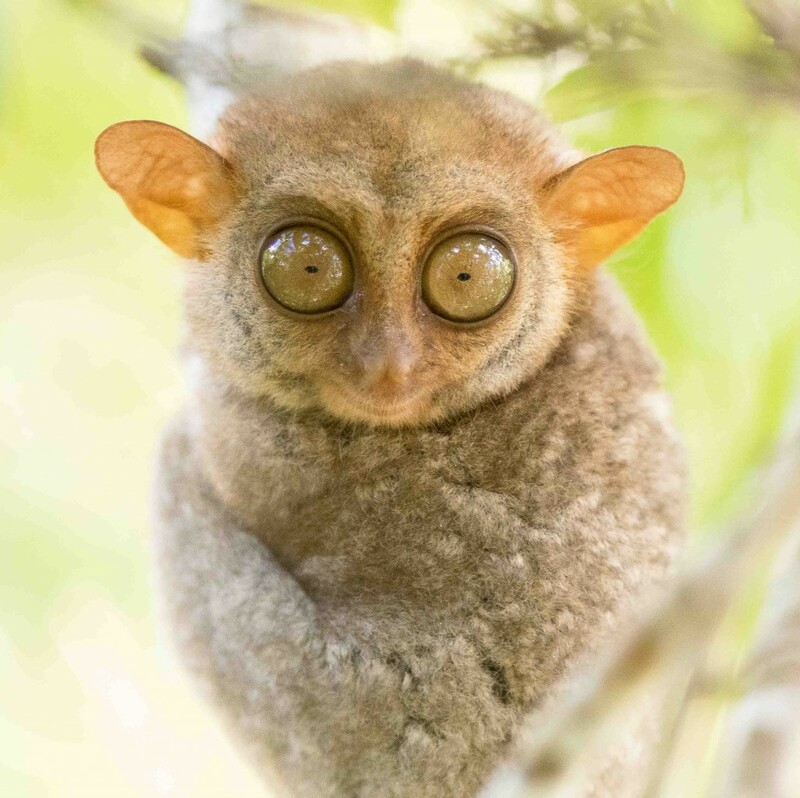 I was pretty sure I should visit the island of Bohol, where I could see Colugos and maybe a Tarsier. 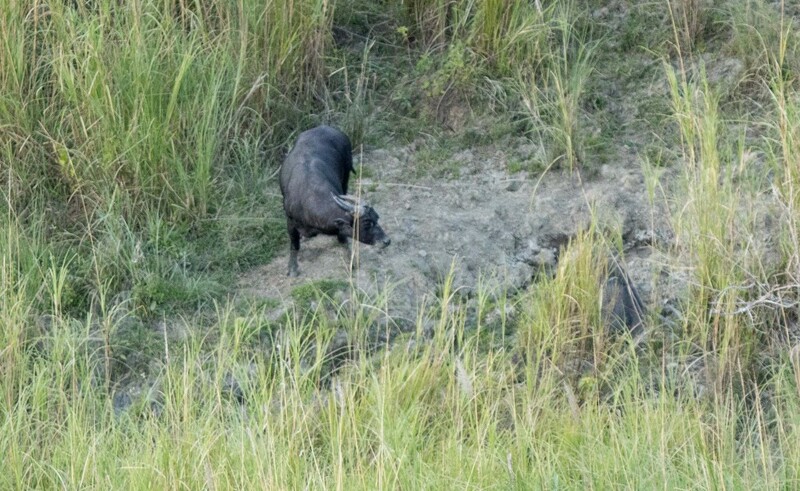 And after chatting with Dominique Brugiere I discovered there ought to be a good chance of seeing a Tamaraw – the endemic and critically endangered dwarf buffalo – on the island of Mindoro. Sold. There are surprisingly few reports from the Philippines on mammalwatching.com: in fact, in late 2015, just two. Thankfully Fiona Reid and David Bishop, both of whom knew the country, came through with some great contacts. Fiona Reid introduced me to Nina Ingle, bat person and President of the Philippines Wildlife Conservation Society. Though she was going t be out of the country she was kind enough to introduce me to Reizl Pamaong-Jose of Bohol Island State University and Geoff Tabaranza of Mindoro Biodiversity Conservation Foundation. Meanwhile David Bishop introduced me to Filipino wildlife tour operator Nicky Icarangal who had great tips for Bohol (which I followed to the letter) and also introduced me to Rodel Boyles, aka Mr Tamaraw, on Mindoro (Geoff Tabaranza also introduced me to Rodel – he really is the go-to guy for Tamaraw watching). 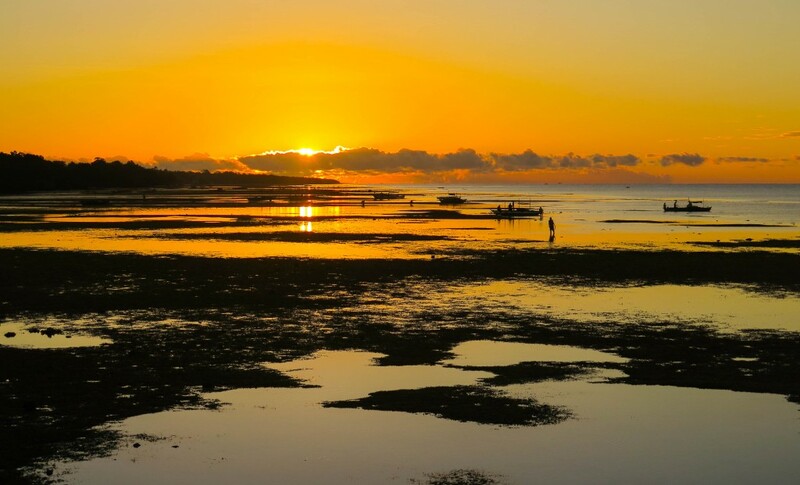 Bohol is a 90 minute flight from Manila. 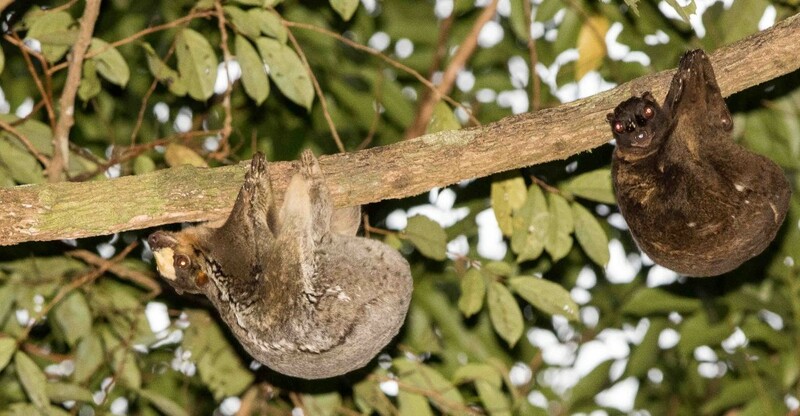 It is on the tourist circuit – and particularly well known for its diving – though from the mammal watchers point of view the Colugos and the Tarsiers are the star attractions. 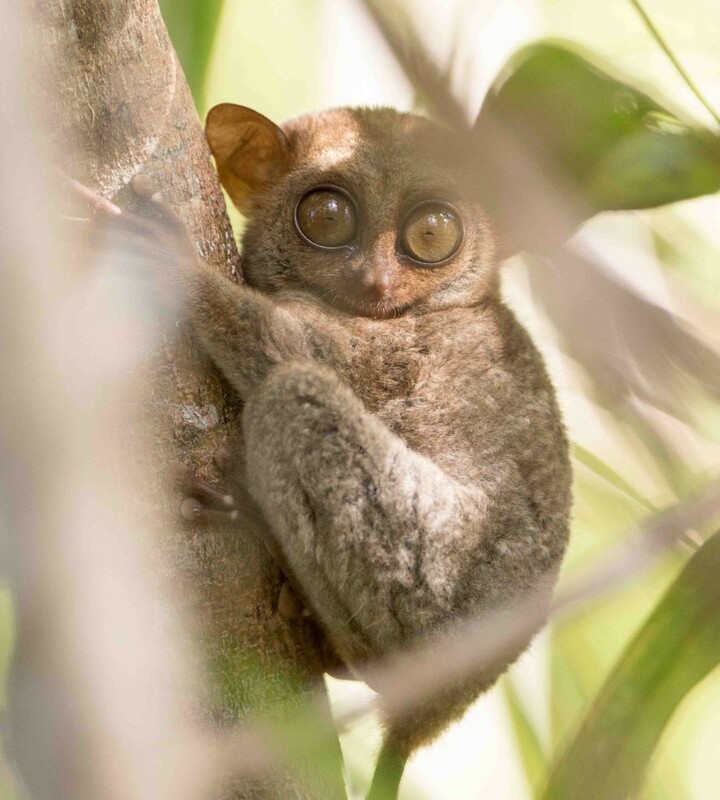 Nicky Icarangal recommended I stay at Habitat Bohol (formerly called Simply Butterfly ) and book their guide Julius to search for Colugos and Tarsiers. This is not be the fanciest accommodation on the island, but it might be the friendliest. It is also home to Julius, who is a fabulous guide. On the first afternoon, Julius took me on the back of his motorbike to the nearby Rajah Sikatuna Park. 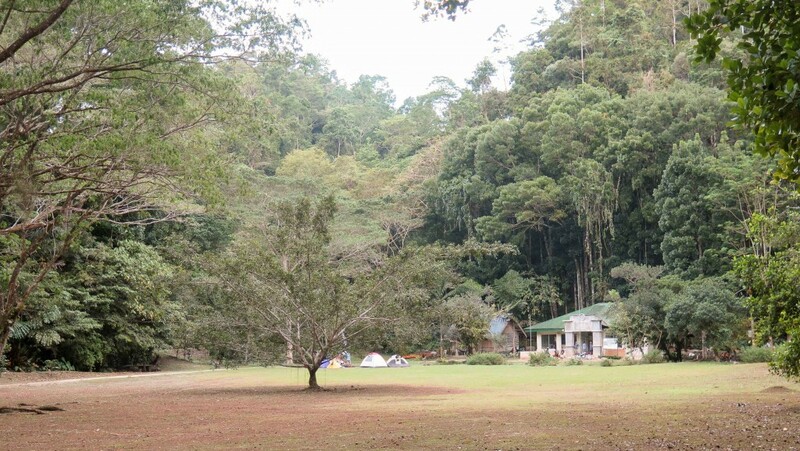 We drove a few kilometres through the park until the road ended at a grassy campsite/ recreation area called “Magsaysay Park”. Colugos are abundant here. It took Julius less than five minutes to find a pair in the trees at the edge of the open area. 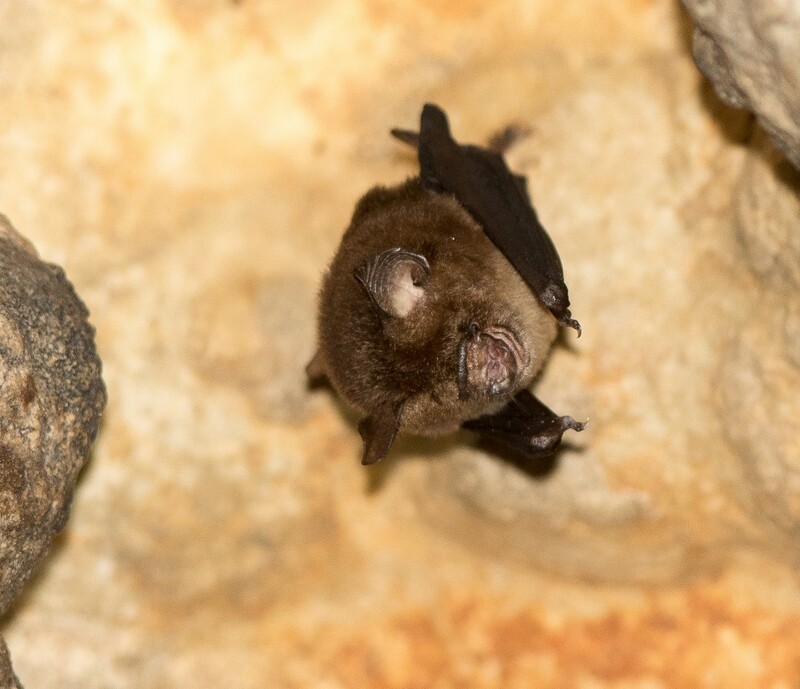 In a small cave nearby we found a few of the distinctive Asian Sheathtail Bats (Emballonura alecto). 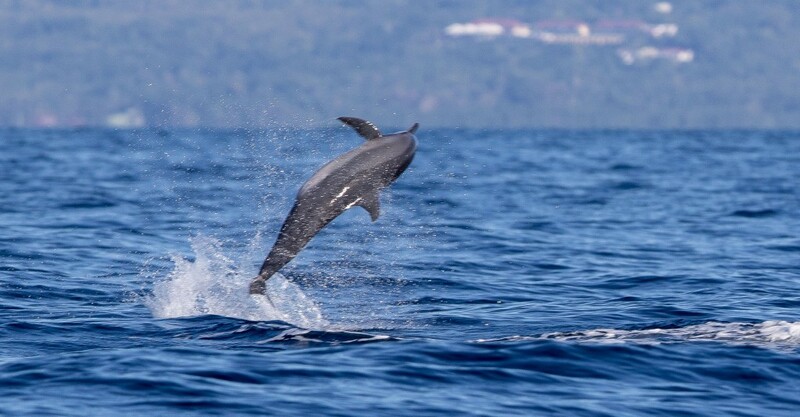 The next morning I was driven down to the coast before dawn to pick up a 5.30am boat for some dolphin watching around Pamilacan Island (contact Joselino “Jojo” S. Baritua from Pamilacan Island Dolphin and Whale Watching Tours ). The trip was very reasonably priced: six hours for 60 USD which included lunch on the island and a snorkel over the reef. A range of interesting species have been reported from here including Beaked Whales, Kogia sp. Melon Headed Whales, Frasers and Rough Toothed Dolphins, along with seasonal Bryde’s, Sperm and Blue Whales. The species mainly encountered though are Spinner and Bottlenose Dolphins and I was happy to get a good look at a pod of the former: the first time I have seen Spinners spinning. I got back to Habitat Bohol after lunch. Julius had, the day before, seemed pretty confident that he could find me a Tarsier this afternoon. I was sceptical about this. And my scepticism wasn’t helped by my total lack of Tagalog and Julius’s very basic English. 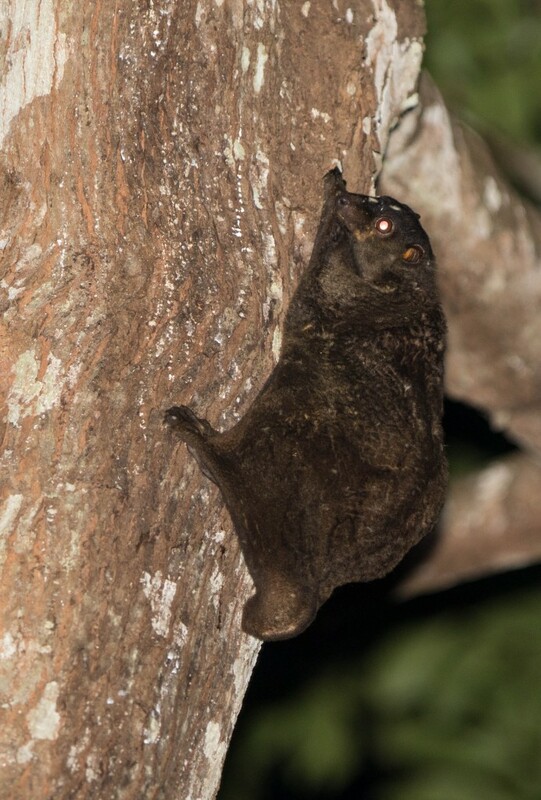 From what I could gather – and there is a lot of room for error here – Julius claimed to know how to find Tarsiers in the day time, particularly in secondary forest, and had worked with at least one university researching this species. He’d planned to walk through the forest while I was out that morning to find one, which he would then take me to see. 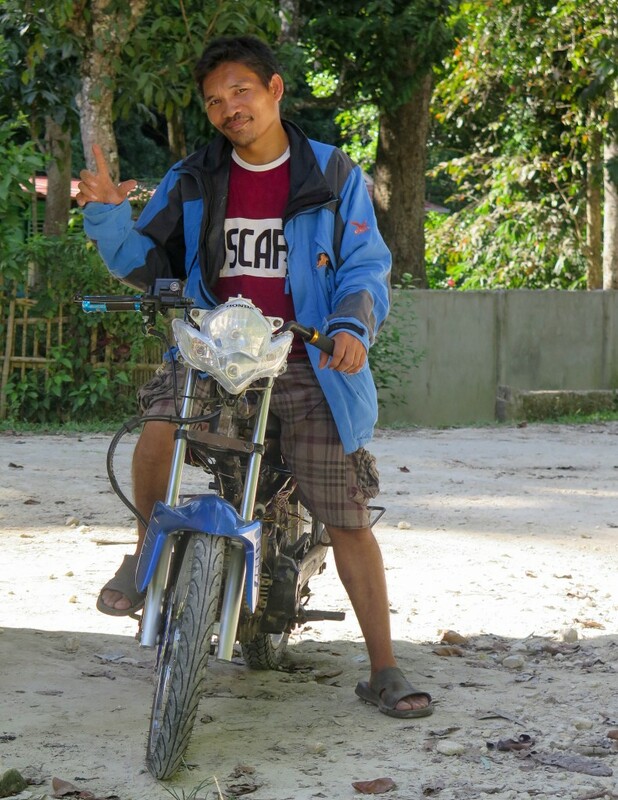 Julius took me on his bike to a patch of scrubby forest near his house, not more than 10 minutes from Habitat Bohol. This spot was where (I think – communication was more guess work than comprehension) he had heard a Tarsier early that morning. 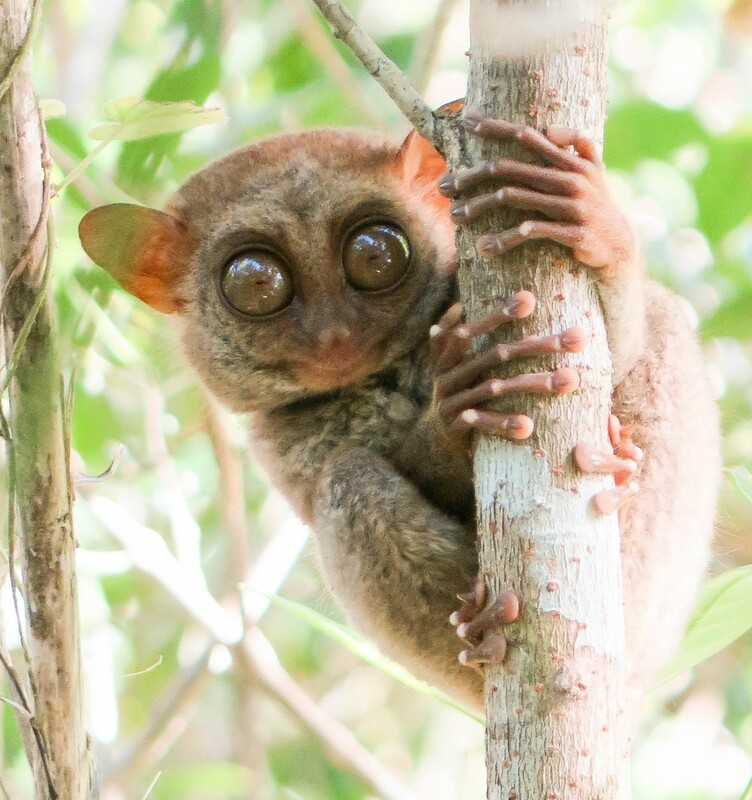 He walked 20 metres into the forest, looked around for a minute and called me over: he’d found a Philippine Tarsier roosting in a tree a metre or two off the ground. It wasn’t shy, and although it jumped around a bit, it didn’t seem to mind my approaching within two metres to take pictures. I don’t understand how Julius found it so easily and whether this is guaranteed. But I swear the animal wasn’t nailed to a branch. 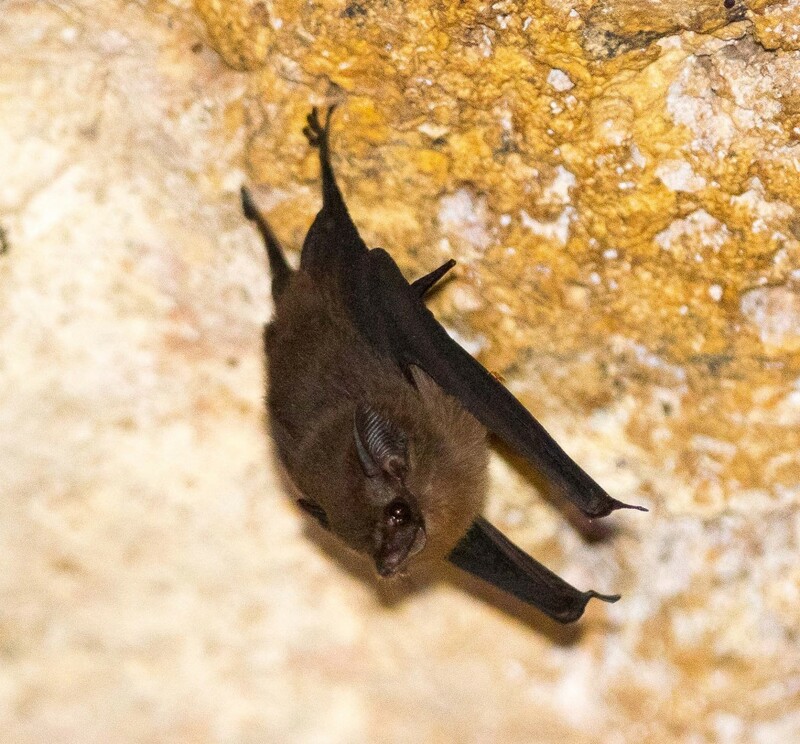 Flushed with success, Julius took me to a large cave, a few kilometres away which he said was full of bats. He wasn’t wrong. There were several species inside and a big thanks to Reizl Jose for helping me to ID them. 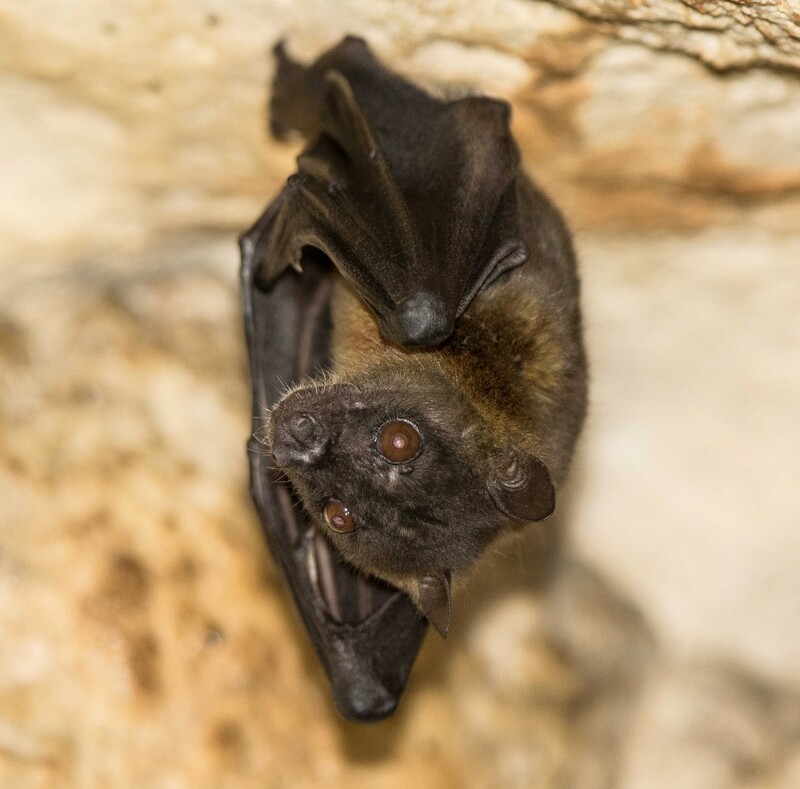 Dozens of a smallish megabat near the entrance were my first of the endemic Greater Musky Fruit Bat (Ptenochirus jahori). 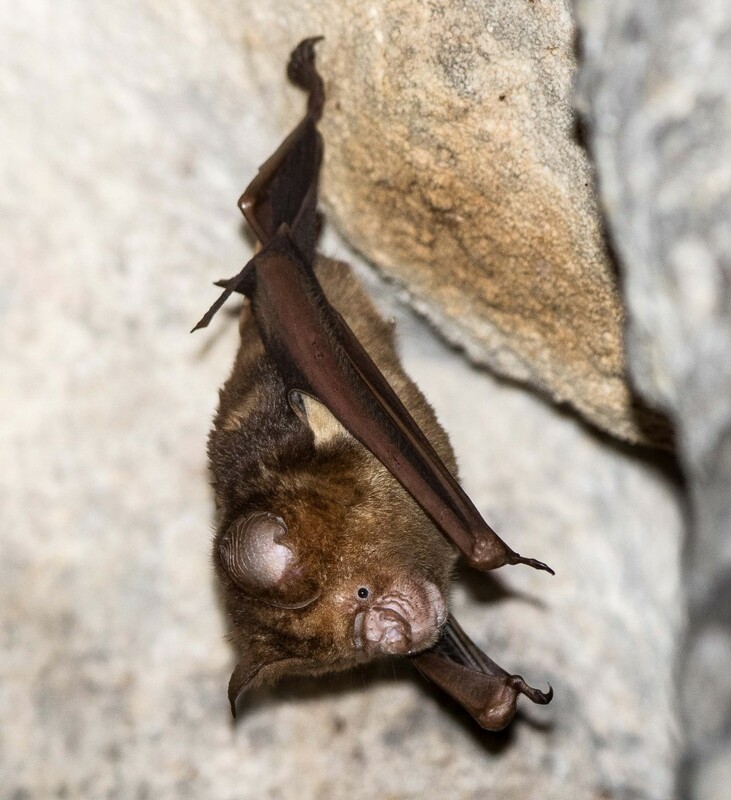 The main species inside the cave were Diadem Roundleaf Bats (Hipposideros diamema) – I had forgotten how big they were – roosting in their hundreds or thousands. 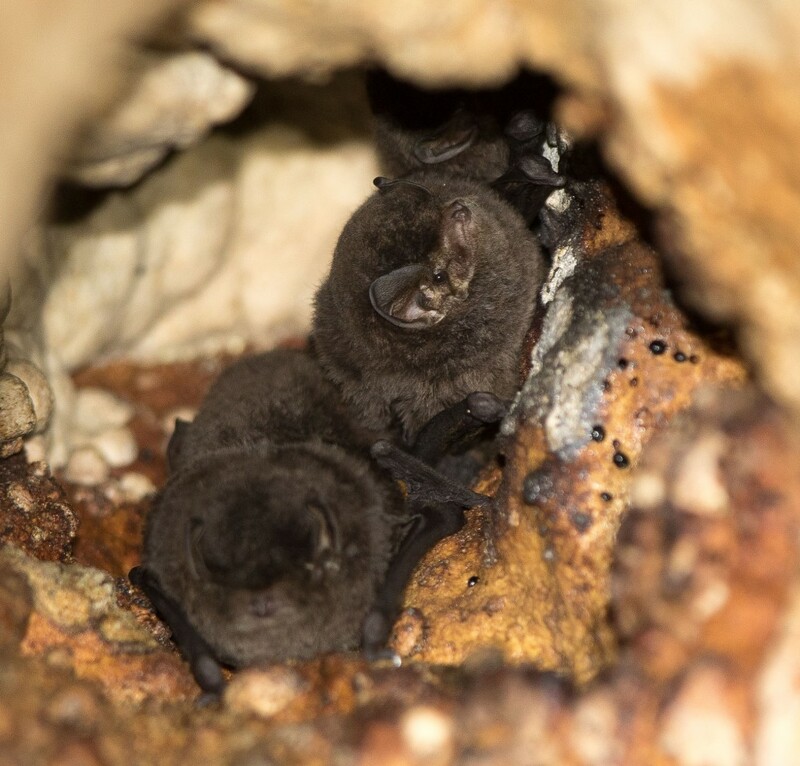 A few smaller bentwings were roosting in the weep-holes in the roof of the cave, but I would have had to have caught and measured them to ID them down to species level (presumably either Miniopterus australis or M. schreibersii). 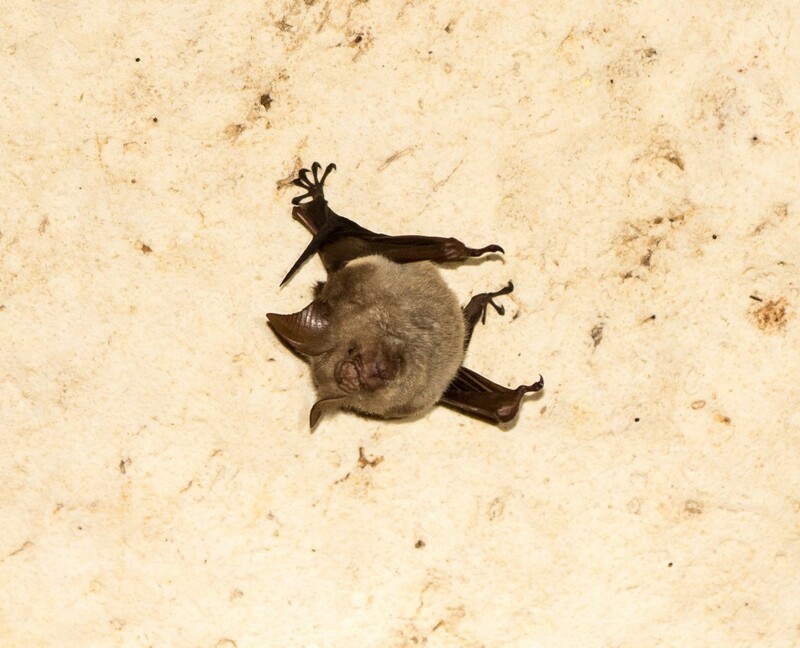 And there were also a few much smaller hipposideros species (quite tiny compared to the Diadems) scatterd around. Reizl identified these as Dusky Roundleaf Bats (Hipposideros ater) and Philippine Pygmy Roundleaf Bat (Hipposideros pygmaeus), the latter also a lifer for me. A fun afternoon. But a crushingly humid walk up to the cave. Subic Bay is a couple of hours north of Manila and a trip there is an easy way to see the endemic Golden-capped Fruit Bats (Acerodon jubatus). There are several hundred roosting in trees near the southern end of the airport (keep following the road past the airport and the bats are on the right just before the T junction at the southern tip of the airport). 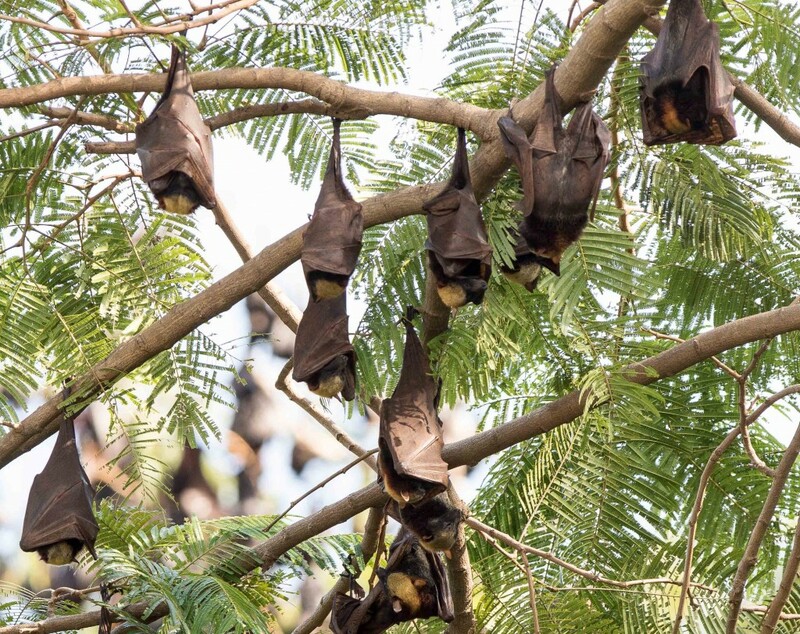 There are also Giant Flying Foxes (Pteropus vampyrus) in the same roost, though the bats seem to cluster according to species. I planned to fly to Mindoro from Manila after I finished my work commitments. Although Cebu Pacific Air operate only a few flights a week, the timing was perfect: out of Manilla on a Friday and back early Monday to connect to my flight home to New York. But the APEC Heads of State summit got the better of me: the comings and goings of various presidents meant a virtual closure of the Manila airport for several days and my flight was cancelled. Undeterred, I took a 13 hour bus and ferry trip. There are various ways to get to San Jose in Mindoro but my overnight trip was surprisingly easy and comfortable (largely because the bus was a quarter full …. It was a different story on the way home). 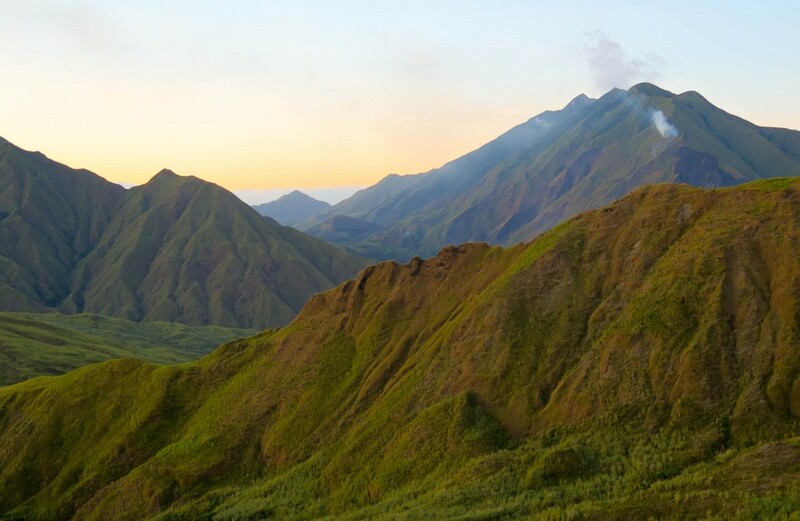 To see a Tamaraw you have to go to Mt Iglik-Baco National Park. The best way to visit the park seems to be through Rodel Boyles who runs the Tamaraw Conservation Program (TCP) in San Jose, Mindoro. Rodel and his team run a conservation program, not a tour agency. And though they can arrange visits to the park, do not expect the sort of customer service you might get from a travel agent. Rodel responded to emails intermittently; but he did respond eventually and was ready for me when I arrived. 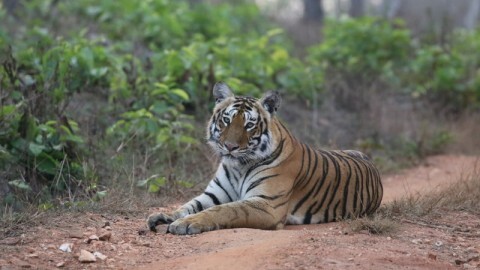 He arranged transport to the park entrance, porters, a compulsory guide and permit, groceries and so on. My 24 hour visit ended up costing $350: about $200 of which was groceries. Granted there were at least five people in our entourage but I think it would have been a lot cheaper had I done the shopping myself. Still the left-over food (and beer) presumably went back to the local indigenous communities thereby adding weight to the idea that there is money in seeing – not spearing – Tamaraws. Though the Tamaraws are critically endangered, and survive in just a couple of sites on Mindoro, Rodel and his team have had some success and numbers had increased to over 400 in the 2015 annual count. 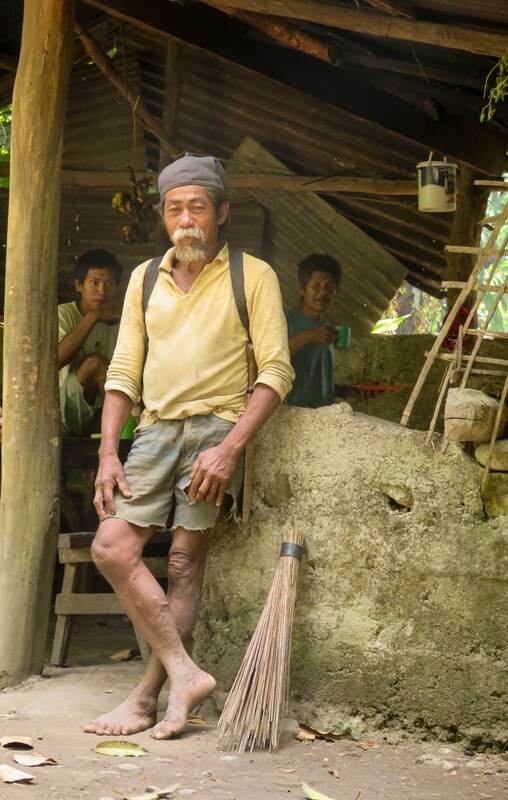 A lot of Rodel’s work is with the local indigenous tribes, whose territories surround the Tamaraw core habitat and who still hunt the animals. Trips like mine employ locals as porters and should ultimately benefit conservation. I could find very little information about visiting the park other than what Dominique Brugiere could recall from many years earlier. So here are the details. Getting to the Tamaraws means a one and a half hour drive from San Jose to the park entrance, and a six hour walk. i.e. all day. My bus pulled into San Jose at 6 a.m. but by the time Rodel had met me; we had repaired our transport to the park (a Jeepney, which is a sort of stretch limo jeep that is ubiquitous in the Philippines); waited for breakfast; waited for someone else; and picked up more groceries it was 11 a.m. before I got to the start of the trail. There are three national park stations en route. Station 1 is a 30 minute walk from the trail head (though by 2016 the road should run all the way there). Station 2 took another 2.5 hours walk from Station 1. Station 3 is a further hour and 20 minutes from Station 2. It is 25% quicker on the way down. Long rest stops and food seemed to be the go at each station (indeed I had to push my guide to leave Station 2 so we could get to the top before dark). The walk is a steady – but not too taxing – climb. November is the start of the cool season. It was brutally hot and humid when the breeze and shade stopped. I do not want to imagine how unpleasant this would be in May. Mount Iglik-Baco National Park: view from research station 3. 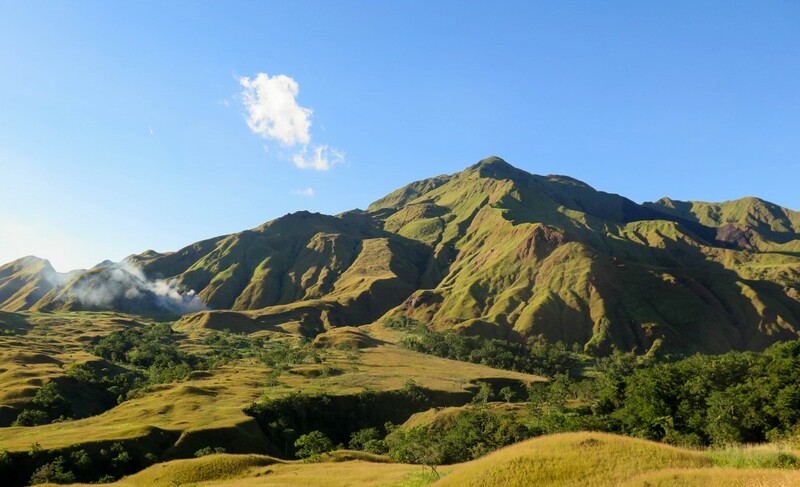 I arrived at Station 3 at 5 p.m. and saw my first Tamaraws as soon as I got to the top of the small hill behind the bunkhouse. 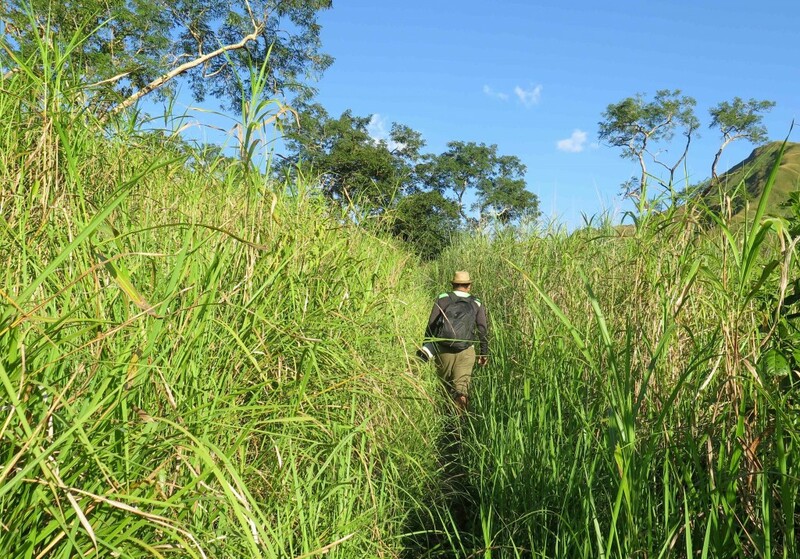 The next morning I spent three hours staking out an area of grassland abutting a forest patch about a mile east of Station 3: an area which I was told was good for both Mindoro Deer and Warty Pigs. I didn’t see either but did see a couple more Tamaraws. Tamaraws are all around Station 3 and easy to spot. 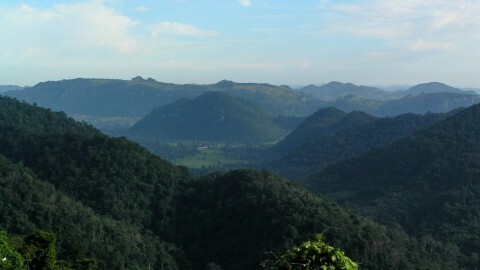 The mountain is mainly meadow – albeit with shoulder high grass that hides everything – and small islands of forest. The Tamaraws emerge from the trees in the early mornings and mid to late afternoon. When the moon is full – as it almost was when I was there – they become more nocturnal and harder to see. There are several hundred living on the mountain top. This is an artificially high density, but the animals are pinned in by hunting pressure from the indigenous communities surrounding them. Rodel runs the annual Tamaraw count in mid-April, when the park is closed for a few days to visitors. 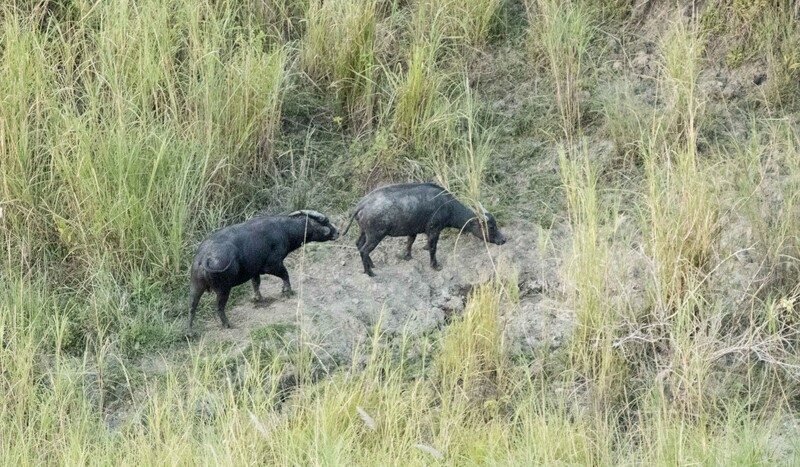 But immediately before – or after – the survey might be the very best time to visit: the TCP burn the grass to prepare for the count so both Tamaraws and other mammals would be easier to see. It is going to be stinking hot though. Tamaraws aside, there are other interesting mammals living up there, though it was difficult to get accurate information and much of what I was told was contradictory. So far as I could gather, Philippine Brown Deer (Rusa mariana) are not uncommon, and Mindoro Warty Pigs (Sus oliveri) are also seen from time to time. I saw neither though did see fresh deer poo and heard them barking at night. The Station 3 rangers had seen a pair of deer the afternoon I arrived. With a longer stay – even just 2 nights – I imagine I would have had a pretty good chance of the deer. The pigs seem harder to spot though as I was leaving I was told that another bunk house (visible on the left as you walk from Station 2 to Station 3) was a better place to see both deer and pigs. With two nights there I would have been “sure” to see both species. Please check it out and let me know. Even more interestingly, the rangers talked about some large rats – “Cloud Rats” – that they sometimes see on the rocks in the forest near Station 3 early in the morning. I walked down there shortly after dark – just a couple of hundred metres from the bunkhouse – and heard something largish running through the leaf litter on the rocks that sounded about the right size for a Cloud Rat. But I didn’t see it. I walked back after dinner and though I heard a few rustles didn’t get close to seeing anything. I then slipped and lost the trail, which resulted in a battle through the razor sharp grass to get back to the station. The resulting scars looked more like a shark attack than a grass cut. Take care. The accommodation in the bunkhouse is rustic but the food was tasty, the TCP provided a mattress and a sleeping bag, and there were very few biting things other than a leach or two near the forest. A big thank you to everyone who helped before, during and after this trip especially Fiona Reid, David Bishop, Nicky Icarangal, Rodel Boyles, Geoff Tabaranza, Reizl Jose and Nina Ingle. Filipinos are an incredibly friendly group of people. I must go back.